Tensions between the judiciary and the government flared up once again on Saturday as both sides cautioned each other against crossing the “lakshman rekha”. Tensions between the judiciary and the government flared up once again on Saturday as both sides cautioned each other against crossing the “lakshman rekha” with Law Minister Ravi Shankar Prasad recalling that the Supreme Court had failed while the high courts had shown “great courage” during the Emergency. 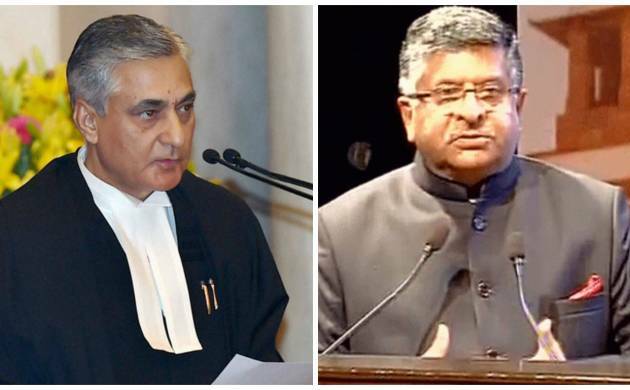 Differences between the two sides first showed up when Chief Justice of India TS Thakur said at a function on Saturday morning that there is shortage of judges in high courts and tribunals requiring government intervention, a view Prasad strongly disagreed with. Later, at another function in the Supreme Court lawns, the CJI cautioned that no organs of government should cross the “lakshman rekha” and stressed judiciary has been given the duty to watch that all remain within their limits. “Emergency brought out strengths and weaknesses of the Constitution,” he said responding to the AG’s remarks. However, the Law Minister was very vocal in attacking the Judiciary by saying that the “Supreme Court failed us during the Emergency and all high courts showed great courage”. “Courts may quash the order of the government. Courts may set aside a legislation but the governance must remain with those who are elected to govern,” he said, adding handling of the issues relating to Emergency in the ADM Jabalpur case in which the apex court held that even Fundamental Rights can be suspended was a “monumental lapse”. He allayed apprehensions on curtailment of freedom by the present dispensation saying not only he but also the Prime Minister suffered during the Emergency and “it will preserve the freedom of all organs of the State”. Justice Khehar said, “Judiciary is mandated to shield all persons, citizens and non-citizens alike, against discrimination and abuse of State power.